At South West Steel Supplies Ltd we can offer a huge range of power tools. Angle grinders, Drills cordless & corded, Jigsaws, Routers the full range. 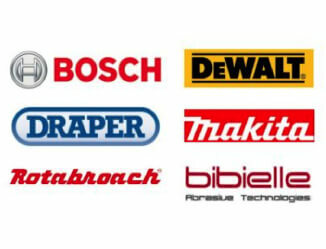 We can offer all makes & models including Bosch, Makita, Hitachi, Dewalt & Metabo to suit all tastes & budgets. For prices and Power Tools available give us a call or fill in a request a quote form. We offer a vast array of power tools and hand power tools and this range is extremely beneficial in a plethora of construction applications. We stock a variety of tools from manufacturers such as Bosch and Makita. For any situation and to make construction faster and more effective, we have a huge range of power tools to ensure that your construction projects are greatly enhanced. Tools such as hand saws, power drills and hammer drills are essential pieces of equipment across a plethora of building and industrial sites. Electrical tools not only boast a vast amount of power, they also utilise precision for use in construction projects. South West Steel offers a huge variety of power tools. If you are looking for these products and wish to see dimensions and prices then do not hesitate to contact us today for a free quotation.